Local Discounts for Riding Your Bicycle! When you see our logo below on the front door of a local business, they are a proud member of our Local Business Discount Program. Ride your bicycle to the business, (new:) take a selfie with your parked bike, and show them your selfie when you request the BFOC discount. 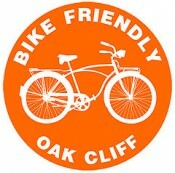 Then post your selfie online with #bikefriendlyoc or #biketobishop and encourage others to bike in Oak Cliff! We neighbors have the distinct advantage of being able to bike to our local shops. And we thank these generous businesses for supporting their local customers! If you are a business owner and would like to offer a discount to cyclists, please contact Amanda Popken at amandapopken at gmail.com. Thanks for your support! 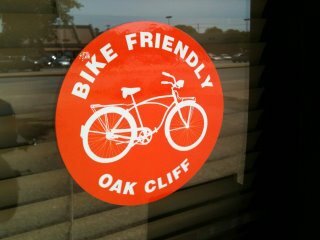 IS THE PICTURE ON THE WEBSITE FROM OAK CLIFF AREA? I don’t think the places that you have listed to updated. My friends and I visited to some business and had no idea about the is count or didn’t honor it. Is this true? Leonel, that list was recently updated late last year. We now have a new coordinator working on better communications with the businesses in ensure the discounts are met or they will be removed. Many times I have to insist on the discount and show them our site. We’ll have a way for people to report those businesses. thx for the feedback!